The magic kicked off on today’s show as Mickey Mouse, Minnie Mouse, Donald Duck, Goofy and Pluto joined Whoopi Goldberg, Joy Behar, Sara Haines, Jedediah Bila and Sunny Hostin live in studio to share the exciting news that “The View” will broadcast from Disney’s Animal Kingdom at Walt Disney World Resort in Lake Buena Vista, Fla. March 6-10 (11 a.m.-12 p.m. ET). The co-hosts will enjoy entertaining conversations on the hottest topics and welcome celebrity guests to the stage at the Tree of Life. 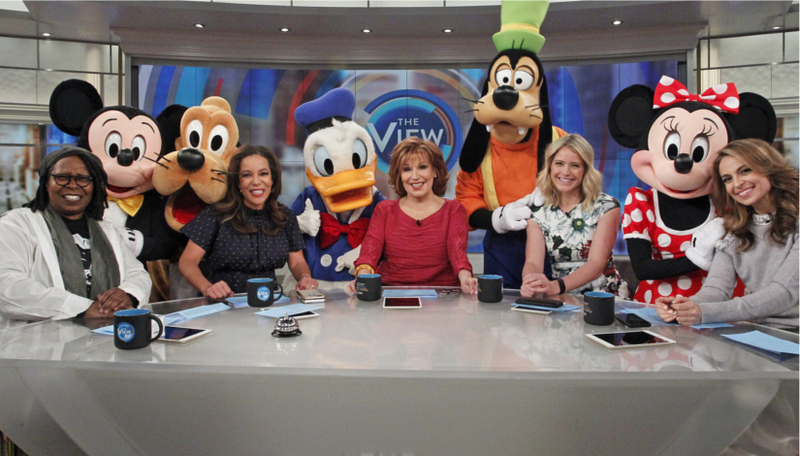 “The View” continues its year-long celebration of season 20 with its first-ever broadcast from Walt Disney World and ratings up across the board, making it the only broadcast daytime show to see gains in the key demos this season. The show previously broadcast for one week from the Walt Disney Studios in Burbank, Calif. in March 2009 and from the Disneyland Resort in Anaheim, Calif. in Nov. 2013. The excitement continues with “The View”’s “Magic Is Endless” Sweepstakes presented by American Tourister, offering the chance for three lucky viewers to win grand-prize packages including a trip for themselves and up to three guests each to Walt Disney World Resort, attend the taping of “The View” at Disney’s Animal Kingdom and receive a $500 Disney gift card. Plus each grand-prize winner and their guests will receive a hardside carry-on suitcase featuring Disney and Star Wars characters courtesy of American Tourister. The entry period ends Jan. 29 at 11:59 p.m. ET. “The View”’s “Magic is Endless” Sweepstakes is open to legal residents of the 50 U.S. & D.C., 18 or older. No purchase necessary. Winners must travel between March 3-8, 2017. Viewers can enter for a chance to win at www.TheViewMagicIsEndlessSweepstakes.com or by visiting The View’s homepage at abc.com/theview, which contains full details and Official Rules. Why or is this good thing?